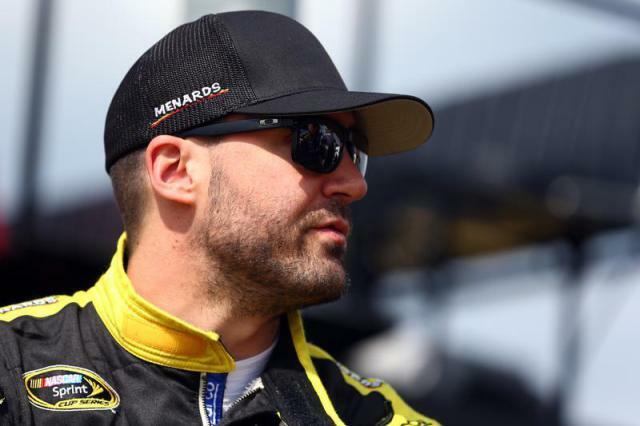 Paul Menard, with a qualifying lap speed of 189.673 MPH, will lead the field of 29 cars in tonight’s non-point NASCAR Sprint Cup Series (NSCS) Sprint Showdown at Charlotte Motor Speedway (CMS). Starting second in the event with a qualifying lap speed of 189.660 MPH will be Greg Biffle; followed by David Ragan (189.049 MPH) starting third, Clint Bowyer (188.298) fourth and Martin Truex Jr. (188.173) starts fifth. Rounding out the top-10 starting positions will be Kyle Larson (188.101 MPH) who starts sixth, Martin Truex Jr. (188.055) seventh, Danica Patrick (187.996) eighth, Casey Mears (186.981) ninth and Michael McDowell (186.884) will start from the 10th position. The 30th annual Sprint Showdown is schedule to get underway around 7:15 p.m. (ET) this evening, and FOX Sports 1 will provide television coverage of the race. Matt Kenseth, with a qualifying lap speed of 128.632 MPH, captured the pole Friday for the NASCAR Sprint Cup Series (NSCS) Food City 500 in Support of Steve Byrnes and Stand Up to Cancer, which will be held on Sunday at Bristol Motor Speedway (BMS). This was Kenseth’s first series pole of the 2015 season, his 14th series career pole and his second series pole at Bristol Motor Speedway. Starting second on the outside pole with a qualifying lap speed of 128.442 MPH will be Brad Keselowski, and he’ll be followed by Carl Edwards (128.322 MPH) starting third, Kevin Harvick (128.211) fourth and Denny Hamlin (127.419) starts fifth. Rounding out the top-10 starting positions will be Joey Logano (127.317 MPH) starting sixth, Kurt Busch (126.871) seventh, Kasey Kahne and Paul Menard (with the identical lap speed of 126.829 MPH) will start eighth and ninth respectively, and Jamie McMurray (126.612) starting from 10th. 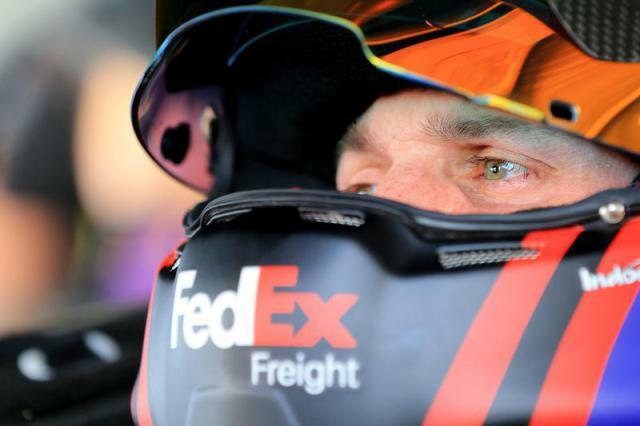 Failing to make the 43-car starting lineup were Brendan Gaughan and Ron Hornaday Jr.
On Saturday, the qualified teams will have two more practice sessions beginning with a early morning session (8:30 a.m – 9:25 a.m. ET – On FOX Sports 1), and then their final (“Happy Hour”) practice later that morning/early afternoon (11:30 a.m. – 12:25 p.m. ET – On FOX Sports 1). All Stewart-Haas front row for Texas. Kurt Busch wins pole, Kevin Harvick second. Friday night at Texas Motor Speedway, Kurt Busch, with a qualifying lap speed of 193.847 MPH, captured the pole for tomorrow night’s NASCAR Sprint Cup Series (NSCS) Duck Commander 500. 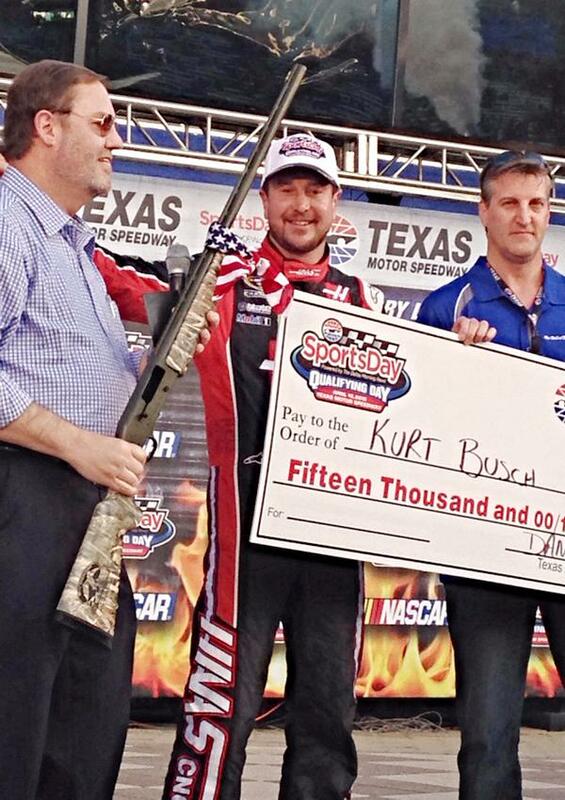 This was Busch’s second pole of the 2015 season, his 18th series career pole and his first series pole at Texas Motor Speedway. Busch’s fellow Stewart-Haas Racing (SHR) teammate and series defending champion, Kevin Harvick, will start second on the outside pole with a qualifying lap speed of 193.722 MPH, and they will be followed by Brad Keselowski (193.195 MPH) starting third, Kasey Kahne (192.933) fourth and Jimmie Johnson (192.424) starts fifth. Rounding out the top-10 starting positions will be Joey Logano (192.369 MPH) starting sixth, Ryan Newman (192.253) seventh, Paul Menard (192.109) eighth and the Chip Ganassi Racing drivers, Kyle Larson (192.048) and Jamie McMurray (191.721) starting ninth and 10th respectively. Failing to make the 43-car starting lineup were Brendan Gaughan and series Rookie of the Year (ROTY) candidate, Jeb Burton. The 19th annual Duck Commander 500 is scheduled to get underway around 7:50 p.m (ET) Saturday evening, and FOX will provide television coverage of the event. During the final NASCAR XFINITY Series (NXS) Hisense 250 practice session at Atlanta Motor Speedway (AMS) on Friday, it was Joey Logano (once again, as he did in the first practice) showing the fastest way around the track with a lap speed of 182.105 MPH. Brendan Gaughan posted the second fastest lap speed of 180.857 MPH, and he was followed by Paul Menard (180.463 MPH) who was third, series Rookie of the Year (ROTY) candidate, Daniel Suarez (180.416) fourth and the defending series champion, Chase Elliott (180.375) was fifth. Rounding out the top-10 fastest drivers in the “Happy Hour” (final) practice were Matt Kenseth (180.363 MPH) who was sixth, Kevin Harvick (180.281) seventh, Brian Scott (180.258) eighth, Regan Smith (180.146) ninth and Erik Jones (179.842) posting 10th. Qualifying to determine the starting lineup for Saturday’s race will be held that morning at 9:10 am (ET – On FOX Sports 1). Greg Biffle currently holds the series’ qualifying track record at AMS with a lap speed of 192.300 MPH, which he set on October 25, 2003. The 24th annual Hisense 250 is scheduled to get underway around 2:20 pm (ET) Saturday afternoon, and television coverage of the event will be provided by FOX Sports 1. Friday afternoon at Daytona International Speedway, the 2015 NASCAR Sprint Unlimited starting lineup was determined by random drawing, and starting up front in the number one position will be Paul Menard. Rounding out the top-ten starting positions will be Kasey Kahne drawing the second starting spot, Joey Logano third, Brad Keselowski fourth Kyle Busch fifth, Austin Dillon sixth, Greg Biffle seventh, Kevin Harvick eighth, Denny Hamlin ninth and Martin Truex Jr. will start from tenth. The teams will have two practice sessions this evening prior to the event tomorrow night beginning with first session running from 5:00 pm – 5:55 pm (ET -On FOX Sports 1) and then their “Happy Hour” (final) practice from 6:30 pm – 7:30 pm (ET – On FOX Sports 1). On Saturday, the teams will switch over to their Daytona 500 cars for two practice sessions which will run from 10:30 pm – 12:25 pm (ET – On FOX Sports 1), and then from 1:30 pm – 3:25 pm (ET -On FOX Sports 2) before they compete in the Sprint Unlimited — which is scheduled to get underway around 8:15 pm (ET – On FOX) that evening. On a cool, rain free Saturday morning at Chicagoland Speedway, the NASCAR Sprint Cup Series (NSCS) teams were on track for their second MyAFibStory.com 400 practice session, and it was Paul Menard – with a lap speed of 188.772mph – showing the quickest way around the track. Second quickest with a lap speed of 187.780mph, was Kasey Kahne, followed by Kevin Harvick (187.709mph) who was third, Jeff Gordon (187.624) fourth and Carl Edwards (187.370) was fifth. Rounding out the top-ten quickest drivers in the session were Brian Vickers (187.331mph) who was sixth, Aric Almirola (187.227) seventh, Greg Biffle (187.156) eighth, Dale Earnhardt, Jr. (186.728) ninth and Jimmie Johnson (186.509) was tenth quickest. Austin Dillon (186.374mph) was the quickest series Rookie of the Year (ROTY) contender with the eleventh quickest lap speed, while the current series points leader, Brad Keselowski (185.912mph) was twentieth. The teams will return to the track for their “Happy Hour” (final) practice later this afternoon from 2:00 pm – 2:50 pm (ET). The 14th annual MyAFibStory.com 400 is set to get underway around 2:20 pm (ET) Sunday afternoon and ESPN will provide television coverage beginning with their NASCAR Countdown pre-race show at 1:00 pm (ET).